Hala Moddelmog, a veteran of the corporate and nonprofit worlds, became president of the Metro Atlanta Chamber this year. A Georgia native, Moddelmog is the first female to head the organization, which traces its beginnings back to 1859 and the establishment of the Mercantile Association by a dozen local businessmen. 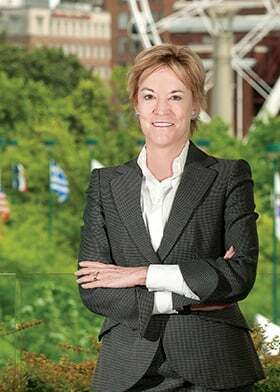 She has a strong business background, including stints as president of Church’s Chicken and Arby’s Restaurant Group and as president and CEO of Susan G. Komen for the Cure. She succeeds Sam Williams, who headed the chamber for 17 years. Susan Percy talked with Moddelmog at the Chamber’s downtown office. Following are edited highlights from the interview. GT: You’ve been on the job for a few months now. How’s it going? Moddelmog: I am loving it. It’s exciting, already rewarding, definitely fast-paced. I think the part I am enjoying most is getting to know people and businesses in the community on just a much deeper level than I did before. GT: Tell us what you and the chamber are working on. Moddelmog: I inherited a well-done strategic plan. The first initiative or pillar [of four] is really around economic development. Everything rolls up to economic development – creating jobs. GT: Is this different from previous efforts to create jobs? Moddelmog: The real difference here is that in the past our chamber – and chambers all across America, for that matter – have been doing a lot of their economic development by recruiting from other places. That is still definitely a component of our economic development, but over the next few years only around three percent of our growth is going to come from straight-on recruiting. The Brookings Institute, the Federal Reserve, the Kaufman Foundation and work that the Boston Consulting Group put together all are indicating that true recruiting, getting one company to move from one city in America to another – that’s just not the most robust way to grow anymore. Moddelmog: You can imagine some of the trends that drive it – [like] two-income families. After the downturn and Great Recession, you’ve got to really have a good reason to spend the money to move someplace. Ironically, though we were getting more and more mobile as a society in the past, a little bit of that has trended off. A lot of companies have moved to where they want to be in the past few years. GT: What does that mean for the chamber’s economic development efforts? Moddelmog: It’s important to concentrate on the other two buckets of growth. One is growing the businesses that are already here. And the part that is truly new is building an ecosystem for startups and entrepreneurs, having true organic growth: companies starting here, growing here, becoming viable here. A lot of technology companies fall within that realm. Another piece I am very interested in is that when we have that ecosystem built for the entrepreneurs and innovators, they will be creating jobs that will be creating a need for “old economy” companies to grow. Moddelmog: There may be an entrepreneurial dry cleaner who needs to open up because we have more jobs, more people doing things, more disposable income. My real hope is that when we are really very successful at growing companies that we will not only get high-paying fancy jobs and companies but will create service provider companies that support that. GT: What’s the second pillar in your plan? Moddelmog: That is our Business and Higher Education initiative. We are working with all the top universities and colleges in the metro region – Georgia Tech and Emory and Georgia State – working with those colleges and connecting them with the business community here so that some of the technology they create can be curated and incubated into a startup and fully completed business. Our connecting role is something we are doing in a big way. GT: Can you give us an example? Moddelmog: We’re doing something called a corporate challenge, so some of our larger companies are going to put some money out and challenge the universities to answer a couple of key questions that will basically serve as R&D for companies trying to grow in a particular area. [We’re] putting these professors, graduate students and undergrads who have new technology, new ideas … letting them get a chance to speak with the bigger companies. GT: What else are you working on? Moddelmog: Our third pillar goes back to elevating our quality of life and working on core infrastructure issues. Encompassed in that is public policy. We have a great public policy team very engaged in working with the Georgia legislature and at the federal level, with other partners in the metro region – to work on policy issues. If they are pro-business we are for them, obviously. If they are anti-business, we are speaking out strongly against them. GT: Didn’t the chamber come out against the “Preservation of Religious Freedom Act,” which did not pass the Georgia legislature, but would have allowed businesses to refuse to serve gay and lesbian customers? Moddelmog: We did. We went about it in the right way. We said instead of rushing this, let’s take it slow and let’s work on it together. Really take a look. We did give a letter to the legislature. Delta definitely spoke out, so did Home Depot and a lot of others. What we did, with permission of the board, [is] on the back of the letter we did list all of the companies on our executive committee, and that is a pretty exciting list. GT: On the subject of public policy, the chamber took a couple of hits for its support of former Atlanta School Superinten-dent Beverly Hall and for the failed T-SPLOST. Does that change anything about the way you operate? Moddelmog: If we feel like legislation is anti-business or anti-jobs, then we feel like it is our responsibility to speak up. So that will drive the legislative agenda. But it’s also important to point out that we are not just against things. We also have a full legislative agenda that we create every year that is legislation we are for and that is pro-business. Sometimes things may seem small, slimmer, versus some of the large issues that the chamber has taken in the past. But taken all together, they really start to build a picture that really is pro-business and promotes business and job growth. It’s a little different approach – not to take anything away from efforts of the past. Personally, I think the chamber did a very good job on the T-SPLOST. I just think it was not time for it. The state just wasn’t really ready. GT: Will the chamber continue to be involved in supporting public education? Of course everyone has 20/20 hindsight when it comes to Beverly Hall and the APS cheating scandal, but some have suggested that the chamber may back off a bit. Moddelmog: The chamber is still working on education, working with a group of business leaders as well as some superintendents around the metro area, because it is important. One of the other bills we worked on this past session was Common Core – we did not want Common Core to go. We did not stand down. I just don’t think the chamber would ever be in a position to say we’re walking away from education or transportation or any of the big issues unless they were resolved. GT: What’s the last pillar in your plan? Moddelmog: The fourth one is really to tell our story. We have so many incredible, wonderful assets. We still need to, in a sense, brand ourselves. What do you settle on that resonates both from a strict benefit scenario and at an emotional level? Even if it’s business, branding and marketing have an emotional component. We are very interested in working with our partners in the region. The Georgia Economic Development now run by Chris Carr – we have a very close working relationship. All the other chambers here – we want to continue and increase our level of collaboration with that group. GT: When you are marketing the Metro Atlanta region, what are the things you emphasize? Moddelmog: Technology. People find it fascinating. There’s more going on in the technology area and startups than people realize: Atlanta Tech Village, the ATDC [Advanced Technology Development Center at Georgia Tech] – that’s 30 years old and in the top 12 incubators in the country. That’s fun to talk about because it’s new, it makes us all feel young. We all love mobility. On the other hand – like when we were in Brazil with the mayor’s trade mission – we talk about the basics. We start with the airport, talk about the largest passenger airport in the world with 94.4 million passengers a year. Maybe even more important, we say to these people, fly into Atlanta and within a two-hour flight, reach 80 percent of the population of the United States. Start with those tangible but extremely important kinds of facts, then finally you get down to Southern hospitality, which actually does matter to a lot of people. GT: Atlanta has a pretty diverse economy. Is that a strength or a drawback in trying to expand our technology sector? People don’t automatically think of Atlanta as a technology center. Moddelmog: One advantage I think we have over a place like Silicon Valley – and it may sound silly because that’s where the ultimate ecosystem is for taking care of technology. But when you go to a cocktail function in Silicon Valley and you are a small tech company, the others are going to be large tech companies. That’s good and bad. In Atlanta, if you go to a cocktail function, you’re going to be there with the third largest concentration of Fortune 500 companies that are consumer-based, service-based, product-based. So you are going to be a tech company that can offer a solution to a very large consumer company who may not have the R&D or expertise to develop that technology. So it’s almost like we are providing these groups the opportunity to connect with their first big customer. One of the things in general the chamber does is make these connections. Our executive committee – the Richard Andersons of the world, the Larry Gellerstedts – is very sincere about making sure these entrepreneurs get a chance to be connected to their big companies. GT: What else is going on in Atlanta that’s exciting? Moddelmog: The metro export plan. The Brookings Institute has chosen about 20 cities [to participate in its Global Cities Initiative] across the U.S. JPMorgan Chase is our big sponsor here. Here’s the thing that’s interesting about exports from Atlanta: 45 percent of our exports are service exports. Some people don’t even know that service exports exist. They think of how many widgets did you send overseas. But we have a huge franchiser community here. I used to run Church’s – in 15 countries. The royalties we would get back every month – the money would come back to the Atlanta region, [because] that’s where the headquarters were. Exporting that service and [having] money coming back here – we have this opportunity to become a world powerhouse in export services. GT: You’ve made some changes in staffing and organization. Moddelmog: One is bringing on Brian McGowan [formerly CEO of the City of Atlanta’s economic development arm, Invest Atlanta] as COO/EVP. He has spent the last 20 years or so working in some form or fashion around economic development – either at the state, federal, city or county level. That was an important match for me because I’ve not done pure economic development. He also has done a lot of other things in his career – branding and marketing, especially, in California and has worked on a regional basis, with lots of different regions and agencies working together. Also very effective for us was putting Katie Kirkpatrick in charge of policy. Katie is leading our public policy, leading our business-higher education [effort] and working on innovation entrepreneurship. She knows the players. She’s very smart strategically about what should be worked on and what’s possible. GT: What made the chamber job appealing to you? Moddelmog: I’m a big Atlanta booster. It really does seem a way to give back to an area that has been very good to me. I have had some very good jobs and career opportunities here in Atlanta. Also, you think through things like education, and the opportunity to have a hand in growing jobs because of what that could do to reviving the middle class. When you kind of take it all the way around, if we don’t work on new jobs, I don’t know how we’re going to bring the middle class back. I started to think about how great it would be to have a hand in making that happen in this region. Maybe the third thing was seeing who’s on this board. It’s truly the top executives in the Metro Atlanta region. Not all chambers or cities have that kind of leadership. To be able to work with those people, I felt it would be hard to turn down. GT: You’re the first woman to hold your position, and you have a few other “first-woman” credits on your resume. How important is that to you? Moddelmog: It’s something to acknowledge, and then get busy doing the job I really came here to do. I’m glad for the chamber and glad for women in general, but really it’s about let’s get busy doing the job.